So here we are, Stage 6, the penultimate stage of the tour and the final stage on the North American Continent. We are running out of road my friends and we hope you are excited as we are. Stage 6 of the Tour de Zack y Tony, AKA Operation: Enduring Freedom!!! will take us through Nicaragua, Costa Rica, and Panama to a little town named Portobelo about 1500 km from the Honduran/Nicaraguan border. We plan to start this stage off slowly, inching our way through Nicaragua, exploring canyons and volcanoes, dancing salsa, and maybe even squeezing in a bit of beach time before picking up the pace through Costa Rica and western Panama. 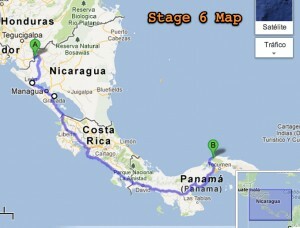 Once we get to Portobelo – the end of this stage – the boat-hunting begins. We have a few rides to try and hitch – one through the canal, one to Colombia, and one to Polynesia/Australia. Then… we begin the seventh and final stage of the Tour by crossing the Darien Gap. Now, you may not be aware of this, but there is no road connecting Panama to Colombia. The Inter-american Highway stops well short of the border and then there is 90 km “gap” of thick green jungle before you get to a highway in Colombia. This is called the Darien Gap. I will go into greater detail on the Gap later, but suffice to say that it is far from safe (or legal) to cross the Gap overland, and so our crossing will like involve a sailboat… or possibly even a canoe. Again, more on all that later. This is going to be a shorter stage time-wise. The road is pretty straight and flat, so we expect to make it to Portobelo before the end of the year.